Christians in Context: from orthodoxy to orthopraxy. : Book Review: reThink - Is Student Ministry Working? Book Review: reThink - Is Student Ministry Working? Roughly 2 out of 3 students who are involved in their youth groups will leave the church after high school. Of that group, only 35% will come back by the time they are 30. A Barna youth survey of teens (70% of whom identified as active in youth group, and 83% of whom identified as Christians) found that 51% of teens believed that Jesus died but didn't rise from the dead, and 58% believe that all religions teach equally valid truth. These stats are not news to many of us. So then how come the foundational assumptions of youth ministry aren't changing? In reThink, Steve Wright (with Chris Graves) argues that today's dominant model of youth ministry is neither biblical nor effective. Youth ministers need to abandon the "drop your kids off here so we can disciple them" mentality and replace it with one that centers on the biblical model of parents discipling their children. We cannot simply tweak what we are doing to have more or less games or more or less Bible teaching. The problem is deeper: the Bible says that parents are supposed to disciple their kids, so the youth pastor's mission should be to facilitate that process. This is not to say that youth ministry ought to be eliminated entirely, as some argue. But it is to say that the model is irreperably broken. Thus Wright begins by critiquing the current model, then arguing that the Bible conceives of parents (not youth pastors) passing on the faith to their children (e.g. Deut. 6:4-9; Ps. 78:1-7; Eph. 6:4, et. al.). Since this is the biblical model, the remainder of the book (about half of it) goes through the application of this parent-centered model and concludes with a series of remarkable stories from his church where this has happened. It is hard to argue with the brunt of Wright's thesis. The stats are troubling (even if we allow room for both statistical variation and the normal wandering from the faith that Jesus predicted in the Parable of the Sower) and the Bible most certainly does conceive of parents' discipling their children. Further, Wright is refreshingly simple, realistic, and aware of obvious concerns (e.g. a youth pastor's obstacles to presenting this new model and non-Christian or uninvolved parents). There are no gimmicks: pray a lot, be biblical and focus on discipleship. A youth ministry book that seriously engages the Bible and advocates no youth ministry pizzazz is rare indeed. reThink is to be commended in all these respects. But of course there are weaknesses. For one, no where does Wright discuss the thoroughly biblical theme of the church as a family. This is an important omission in a book whose central thesis centers on the biblical relationship between family and church! This is not biblical nit-picking. I wonder how a discussion about discipleship for students with non-Christian or uninvolved parents would change if we recognize that the church is a family. Perhaps one implication is that other godly adults in a church would take on a surrogate parenting relationship to such students. And indeed, while Wright addresses the uninvolved parent situation, he can say little more than, "Well, try and make it happen anyway." There is something right about that, but it is also manifestly incomplete. Second, since Wright opens with the troubling statistics cited above that he attributes to the broken youth ministry model, I found myself really wanting to know how his statistics significantly differ. If he is right that those stats are the result of a broken model and if his model is the biblical one, then shouldn't it follow that his percentages should be better? This is a strange omission, especially since he actually mentions questions that youth pastors can use to discover their own ministry's post-high-school effectiveness. He has clearly thought about it, so why no numbers of his own? 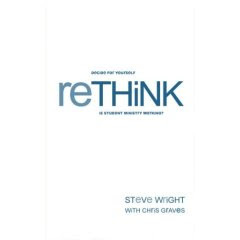 I came across reThink as I was actively asking foundational questions about youth ministry- the kinds of questions, that is, that Steve Wright asks. For any youth pastor who is doing the same, I heartily recommend this book at least as a starting place. Further, I would ask the youth pastor who is gung ho about the usual youth ministry model to read it and tell me where Wright has misstepped. Even if the biblical picture could be filled in further, I suspect that it would be hard to mount a serious biblical argument against his thesis. For these reasons, reThink warrants serious consideration for most youth pastors, and I sincerely hope it gets that due. There is much to commend within Wright's thesis. Along with your questions regarding the Church as a "family unit" I would really like to go down the rabbit trail in regards to teens (or children) from either non-Christian homes or from homes that "claim" Christ but are neither biblical nor concerned (whether they are "Christian" is obviously not my point). I serve as the lead pastor of a congregation and I see some "Christian" parents who are neglecting this great responsibility of parenting (e.g., Deut. 6). We have preached and taught on the subject, yet there are some parents that are just... clueless (or so it seems). Part of this may be our culture, but that is no excuse. And then there are the teens who come from extremely broken homes. What do we do about them and how do we reach them and disciple them and help them grow in their relationship with Christ? Interesting... I would love to hear Wright discuss these issues because I'm genuinely curious about this. And I would love to pass on some resources for our congregation's youth ministry!